A growing number of America’s unbanked and under-banked consumers have been turning to prepaid debit cards as an alternative to checking accounts. Between 2003 and 2012, the total amount of money deposited annually onto these cards increased from $1 billion to $65 billion, and that amount is expected to near $100 million for 2014. But those cards often come with hefty fees and lack protections of other financial products. The Consumer Financial Protection Bureau is looking to make prepaid cards safer and lest costly with a new slate of proposed rules. The CFPB is proposing a number of rules intended to extend the protections currently enjoyed by checking account and credit card users to the prepaid debit card market. • Monthly statements or free online access to account info. • $50 limit on fraudulent transactions for cardholders who report suspicious activity in a timely manner. • Standardized disclosure forms explaining all relevant fees and surcharges. • Limits and regulations involving prepaid debit cards that offer credit in the form of overdraft protection. The prepaid debit category covers a wide variety of products — from cards you purchase at retail and load via ATM or through direct deposit, to payroll issued by employers and benefit cards offered by federal, state and local agencies, to school ID cards used to disburse student loan funds, to mobile debit products that don’t have a physical card. The CFPB’s proposed rules don’t target any specific product but aim to add protections for people who use any or all of these variants. While prepaid cards can be used to replace a number of the most common functions of having a checking account, they generally don’t have the same level of protection that a checking account offers. And those that do offer some of these protections currently do so at the financial institution’s discretion, meaning policies aren’t set in stone. • Easy and free access to account information: Many prepaid products don’t provide regular statements to customers, make it difficult to access your full account data, or charge for inquiring about your account. The proposed rule would require that financial institutions offering prepaid products provide either periodic statements or make account information easily accessible online and for free. • Error resolution rights: As things stand now, if your prepaid card is double charged or overcharged, you may not have a clearly defined way to dispute this error. The CFPB proposes requiring that financial institutions investigate cardholders’ error reports and that they resolve these investigations in a timely manner. If the issue can’t be resolved quickly, the institution would have to temporarily credit the disputed amount to the consumer’s account pending the outcome of its investigation. • Fraud and lost-card protection: While there are strict limits on consumers’ liabilities for fraudulent activity on lost and stolen credit and debit cards, it’s currently up to the financial institutions that issue prepaid products whether or not to limit liability. The CFPB proposal would place a $50 liability limit on fraudulent prepaid card transactions so long as the cardholder promptly notifies his/her financial institution. One of the most frequent complaints about prepaid cards is that it can be difficult to find out a card’s full menu of fees and charges before you activate it. This is especially important for consumers who use prepaid cards to replace checking accounts, as they tend to make more deposits and other transactions than consumers who only use the cards as a secondary way to manage their money. In their recent ratings [PDF] of 23 different prepaid products, our colleagues at Consumer Reports only gave six cards the highest possible rating for Fee Accessibility & Clarity. And even then, there are some fees — like third-party reload fees — that card issuers can’t include on their menus as it is charged by a company over which they have no control. Thus, the CFPB is proposing what it calls “Know Before You Owe” disclosures for prepaid products. These are intended to provide standard, easy-to-understand information about a prepaid account. It not only lets the buyer know what they’re getting into with a particular card, it allows them to compare competing products and choose the one that works for them. Additionally, there is the hope among some advocates that more transparent fee schedules will drive down these fees as issuers try to compete for customers. One of the CFPB’s proposed designs for a standard short-form disclosure that would be required on all prepaid products. Click to enlarge. The CFPB proposal calls for two variations on the disclosure form. The “short” form that calls out the most important account info, like monthly fees, fees per purchase, fees for ATM withdrawals, and fees to reload the account. The proposal would also require that, before a purchase is made, the consumer has access to the full slate of fees and other relevant information on the long form. You can see multiple versions of the proposed short and long form disclosures on this PDF. Additionally, the proposal would require that card issuers make their full card agreements available to the public on their websites. These agreements would also be submitted to the CFPB for posting on a separate site maintained by the Bureau. Though most prepaid products are simple debit accounts — you can only spend what you put in — some cards offer users the ability to spend more money than what’s in the account. These cards are frequently offered by payday loan operations and are not always sold as “credit” accounts. “Some prepaid cards push overdraft ‘protection’ that makes it harder for families to make ends meet, draining scarce wages with fees and leaving a hole in the next paycheck,” explains Lauren Saunders, associate director of the National Consumer Law Center. Whether or not it’s marketed as a credit product, it’s effectively extending credit to these consumers so the CFPB believes these cardholders are entitled to the same protections credit card consumers currently benefit from under the Truth in Lending Act and the CARD Act. For example, rather than simply extending credit to anyone who has one of these cards, issuers of prepaid cards would have to ensure that the cardholder has the ability to repay their debt. 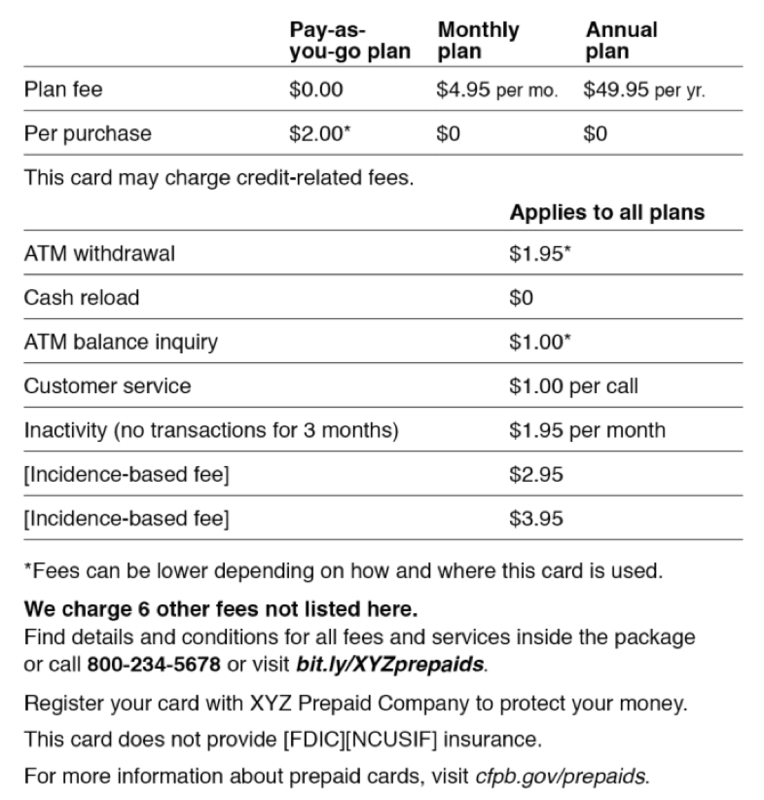 Prepaid credit issuers would also need to provide detailed monthly statements to cardholders. This goes beyond the proposed requirement for prepaid debit products which would give institutions the option of providing a statement or free online access to account info. Additionally, the credit statement would include information like interest rate and amount borrowed. Fees on credit accounts would be limited to 25% of the credit limit during the account’s first year. And unless a cardholder misses two consecutive payments, issuers can not increase the interest rate on an existing balance. Balances on new purchases may be subject to an increase but only after the cardholder has been given 45 days notice. While the above items are a matter of extending credit card protections to prepaid credit products, the CFPB proposal includes some rules that separate the two types of credit. The Bureau proposes a 30-day waiting period, meaning that prepaid card issuers can not extend a cardholder credit during the first 30 days after opening an account. There proposal would also put up a “wall” between the funds on prepaid card and payments to the creditor, so the card issuer can’t automatically deduct funds from an account to repay a credit debt unless the consumer has affirmatively opted into these deductions. Even so, card issuers would be limited to once-monthly deductions from the prepaid account to repay the credit debt. “The proposed rule requires companies to be honest when they are offering credit and not disguise it as overdraft ‘protection’ that can balloon into hundreds of dollars of fees a year,” says the NCLC’s Sanders, who believes that the rules could go even further and ban overdrafts on prepaid cards across the board. “Consumers should be able to rely on a prepaid card being truly ‘prepaid’ and as a safe way to control spending,” says Sanders. Financial Protection Bureau Finalizes New Rules To Curb Predatory Lending, But Will Congress Let It Happen? Next Could Aerosol Deodorants Catch On Again In The United States? Next Up: Could Aerosol Deodorants Catch On Again In The United States?